The Grove is a beautifully secluded Georgian holiday home 10 minutes walk from the centre of Cromer. 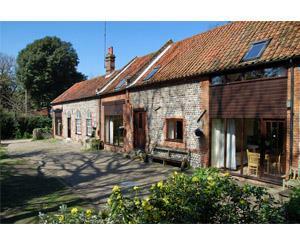 The cottages are five converted barns and a nearby bungalow all in the three acre grounds of the Guest House. Each cottage has its individual character and is fully equipped for an enjoyable holiday. Heated indoor swimming pool, ample parking, table tennis, delightful walks through the woods to the beach, cliffs and golf course. Open all year.